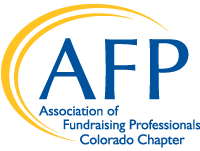 Those webinars listed here are free for AFP Colorado Chapter members and $15 for nonmembers. Once you have made your selection, please send an email to info@afpcc.org with the date and name of the webinar you would like to review. This step is necessary to verify your membership and to satisfy copyright restrictions. Members will receive an email from the office within three (3) business days that contains a link that is valid for two weeks. Non Members will receive a form via email to complete and return with credit card information. An email with a link will then be sent that is valid for two weeks. Webinars are 90-minute long and offer the opportunity for one person or an entire development office to learn the latest information on that subject from one of the best in the field. Each session qualifies for 1.5 points toward CFRE education requirements. NOTE: You will find the CFRE tracking information in the pdf of the handouts near the end of the document. You are responsible for printing and maintaining these records. The chapter office will not keep records of the downloads. March 24, 2015 - Is Your Organization Sustainable?